On a cool morning in late March, eight small motorboats trundled into a quiet backwater branching off the Illinois River. They strung two nets behind them, to trap all the fish in the three miles of water now cut off from the rest of the river. Slowly, they moved toward the far edge of the backwater arm, dropping thousands of yards of nets as they putted along, dividing the now pseudo-lake into compartments along a 1.5-kilometer net they ran down the middle of the backwater. When they reached the back edge, the fishers turned around, revved their engines and started banging on the sides of their boats, shattering the quiet peace of the lake. In response, the fishers report, thousands of Asian carp fled the noise, swimming through the single hole left in the nets, leaving a single river segment totally carp free. The native fish, who hid from the noise instead of racing away, reclaimed the river segment in the carp’s absence. Over the next two weeks, the fishers drove the carp through the river, netting off the carp-free space behind them, in an attempt to catch all the carp in the river at once. Asian carp were introduced to the United States in Arkansas in 1973 to filter pond water in fish farms. Since then, they have moved gradually upstream toward the Great Lakes, leaving a thousand-mile trail of wreckage in their wake. The carp outcompete native fish, degrade water quality, and can even injure boaters by leaping high in the air. After the carp paused their invasion for five years, they were spotted 12 miles farther upstream in the Illinois River last November. And with just 76 miles left until they reach the open waters of Lake Michigan, there’s still no consensus on how to stop them. While politicians and activist groups argue over billion dollar proposals to stop the carp, a group of fishery mangers and commercial fishermen are trying to at least slow them down using a method that’s a lot simpler, faster and cheaper. In October, they voyaged to China to learn the traditional Chinese fishing technique, which they tried this spring in the region of the Illinois River called Upper Peoria Lake — to great success. “It’s quite an undertaking, doing one of these,” says fish biologist Duane Chapman with a laugh. But after catching more than double the fish they would have with a similar effort, “all in all, it’s hard to not call it a pretty good success,” he says. But Chapman, who leads the United States Geological Survey’s Invasive Carp Research Team, is quick to point out that even though this works, it’s still only a temporary measure for a serious problem. Asian carp outcompete native species by eating the tiny animals at the bottom of the food chain, cutting off the food supply to other fish. This leads to algae taking over waterways, degrading the rivers for aquatic life and recreational use. If they enter the Great Lakes, carp could damage the $7 billion fishing industry there. “Invasive species are bad for business, they’re bad for the environment, they’re not a good thing to have around,” says Benjamin Brockschmidt, executive director of the infrastructure council of the Illinois Chamber of Commerce. The most important physical structure between carp and Lake Michigan — the Brandon Road Lock and Dam, a massive 25-foot structure — won’t be further fortified against carp until 2025 at the earliest, says Andrew Leichty, the Army Corps of Engineers project manager for Brandon Road. Its construction hangs on Congressional approval of the projected $1 billion anti-carp renovation. The fortification will hopefully prevent any fish from getting through, which would stop the carp invasion without harming native species that are more stationary. Other options have included physical separation of the river from Lake Michigan, various combinations of water jets, complex noise machines, internal electric barriers at Brandon Road or physical structures like flushing locks. But the carp aren’t waiting on Congress. The best bet right now to slow their continuing onslaught is to remove all the carp from the upper stretches of the Illinois River, says Kevin Irons, who manages the Aquaculture and Aquatic Nuisance Species Program at the Illinois Department of Natural Resources. Because carp require large numbers to spawn, thinning the leading edge may keep the population from voyaging upriver. And after catching nearly 100,000 pounds of carp in their first attempt with the Chinese technique, catching a million pounds might actually be a possibility once they have some more practice. Although it sounds extreme, a million-pound catch is what happens in the shallow lakes around the Yangtze River in China. Last summer, Chapman of the US Geological Survey noticed a passing mention to the Chinese Unified Method of fishing in a book chapter he was reviewing. Intrigued, he and Irons headed to Wuhan, China, for a conference and to talk with local fishers and see the method in action. Despite living thousands of miles apart, they discovered they shared a common language with their Chinese counterparts. “When you get a bunch of real fishheads in a room you almost don’t need a translator,” says Chapman. After talking through the method, they went out to one of the commercial carp lakes to watch the Chinese fishers, who harvest in the winter to take advantage of the fact that carp are sluggish and don’t jump as much when they’re cold. After driving the carp into a single location like cattle into a pen, they were scooped out in a single trap net and sent to market. To use do this in the U.S., Chapman and Irons had to modify the method. American fishing regulations mean that nets can’t be strung across rivers for long periods, so this is only really effective in backwater areas, say Irons. They also had to separate out the native fish, but because the carp are more easily driven than native fish, the fishers were easily able to find and release the native species before collection. The Americans couldn’t pull together the resources in time to attempt the method in the winter, and so had to run their first attempt in overly warm, unpredictable spring weather. Carp were jumping out over the seine net as they started dragging them out of the water, using a net attached to trees with a winch. In the face of 40-mile-per-hour winds and driving rain, a group of roughly two dozen college students helped the fishers pull the carp into a flatbed truck. 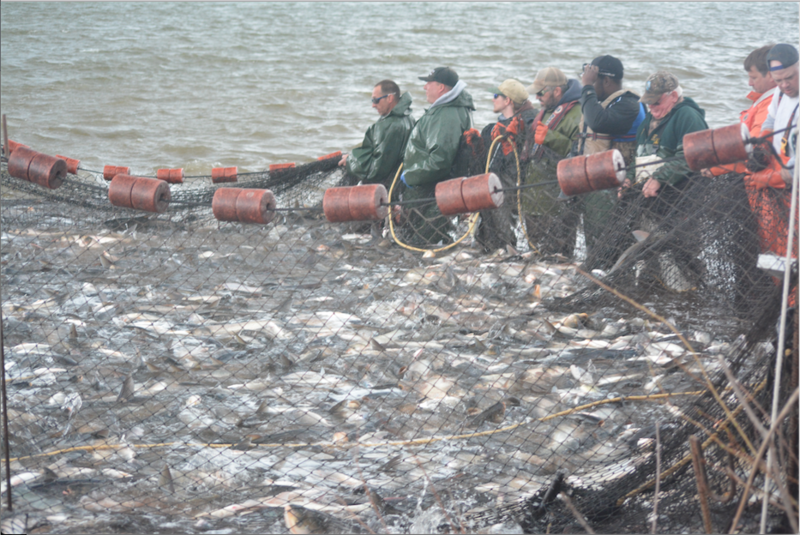 The 100,000 pounds of carp were driven off and ground into fertilizer. “I would say that it’s quite successful for their first time, especially compared to their previous efforts,” says Yushen Chen, an ecologist at the Chinese Academy of Sciences’ Institute of Hydrobiology. In the past, it has taken three months to pull out 100,000 pounds of carp in that area of the river, an amount that only took two weeks with the Chinese Unified Method. Very good now they need to stock native predators Perch Bluegill behind this effort or improve the natural biotic resistance outlined in the common carp studies. Otherwise the ones you didn’t catch just spawn and refill the area you just got rid of the competition and predators or made it a nicer place for spawning/recruitment!